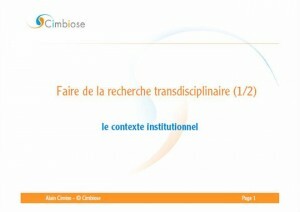 Monter un projet de recherche transdisciplinaire : la conception d’une idée innovante, l’implication des partenaires, la soumission du projet et sa négociation avec les organismes financeurs sont autant d’étapes d’un processus complexe et parsemé d’obstacles. Les chercheurs, souvent plus soucieux de finaliser le volet scientifique du dossier, sont de plus en plus amenés à se pencher sur la préparation du budget, sur les aspects de logistique et sur la préparation des accords de consortium. 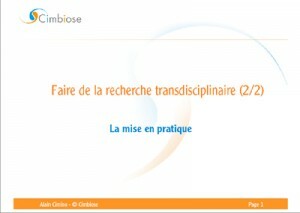 Vendredi 28 mai, Alain CIMINO (Cimbiose) a animé la deuxième séance du séminaire EHESS “Transdisciplinarité” du Centre Edgar-Morin consacrée au montage, à la coordination et à la gestion des projets de recherche collaborative. Sa présentation, en format .pdf est désormais disponible ici et sur la page web de l’enseignement. Quelles sont les sources de financement, les institutions publiques et les acteurs du secteur privé qui peuvent aider la création d’un projet de recherche transdisciplinaire ? Quel est le rôle d’un coordinateur ? Comment structurer le calendrier ? Vendredi 21 mai, Alain CIMINO (Cimbiose) a animé la première des deux séances consacrées au montage, à la gestion et à la coordination de projets de recheche, dans le cadre du séminaire EHESS “Transdisciplinarité” du Centre Edgar-Morin. Voilà la version .pdf de sa très riche présentation, disponible aussi sur la page web de l’enseignement. So here’s the powerpoint presentation of yesterday’s LSE seminar. I want to thank the students and faculty of the Institute of Social Psychology for having me. A special thank you to Prof. Sandra Jovchelovitch and Prof. Saadi Lahlou for the flattering introduction and for the stimulating discussion about the many methodological, ethical and theoretical challenges associated to research on pro-ana websites. This month, for Les Vases Communicants, we welcome Gaby David (LHIVIC, EHESS). You can find Antonio A. Casilli’s post on her research blog Corazonada. Advertisements, as all images, are contextually created and perceived together with all the discourses that come enclosed and to the meanings we give them. Let’s just bear in mind that within the enormous advertisement landscape, mobile advertisements or even just advertisements that deal with mobile phones – as identity construction objects – are part of a wider form of imagery, such as newspapers, fashion magazines, beauty magazines, television, internet, etc. For this, I felt that analyzing some mobile-related commercials would be a good mean to try unveiling how our society’s ethical parameters move, are – or are not -pushed further, and/or in any case discussed. Using the framework of domestication I will analyze three ads, which will be treated as instances of symbolic productions – so to say representations. The domestication concept originated mainly from anthropology and consumption studies as well as from a move in media studies to consider the contexts in which Information and Communication Technologies (ICTs) are experienced. Firstly it came from the wild animal taming metaphor. Then, it was one of Roger Silverstone’s main legacies to put forward the concept, examining how we experience domestication towards ‘media’ technologies. Domestication looks beyond the adoption and use of ICTs to ask what the technologies and services mean to people, how they experience them and the roles that these technologies can come to play in their lives. Such domestication processes include the imagination of how technologies might find a place in the home and a role in people’s lives. How do people, encounter, deal with, reject and/or work out how to fit them into their everyday routines. These verbs relate mainly to the type of life and identity to which people aspire to have. However, “[…] technologies come pre-formed with meanings through the influence of advertising, design and all the media discourses surrounding them, both households and individuals then invest them with their own personal meanings and significance.”[emphasis added]. In other words, individuals do act, but within the constraints of both domestic and social contexts. So, for this article I’ll take into account the mobile representations behind some advertising discourses. Since they often are a mirror of what our societies want and are able to buy – of course also metaphorically speaking! Myths and meanings related to mobile cultural-object phenomena appear also in advertisements and it is through them that a wider symbolism, a collective social discourse could be extrapolated and see light. Let’s see what these advertisements say. Though, immediately if we use the verb ‘say’ at least three problems come to mind: a) The question of pictures saying things; advertisements as any other picture, just provide an example of how pictures don’t literally ‘say’ anything, people (we) do the talking. b) To whom is this saying something? c) Under what circumstances is a particular picture being shown and viewed? Who decides what gets shown and what pictures must not be distributed any further? Blaming it on the publisher’s decisions seems useless, since most of the times decisions are usually based in local community conventions: something that might be accepted in one place might not be so in the other and vice versa. Dear all, just a quick note from Geneva, Switzerland, where the Lift 2010 Conference starts today. I’m going to be speaking on Thu, May 6th, at 3PM , Geneva Time. The reason I am so precise, is that my speech is going to be livecasted. So, if you are interested, and if you have nothing else to do, please just come back to Bodyspacesociety and follow me live on stage. So here it is, our little “manifesto for qualitative agent-based simulation” is finally out on the now Sage-published Bulletin of Sociological Methodology/Bulletin de Méthodologie Sociologique. It is just worth stressing the importance of this article in our present research: our effort has been to really provide a comprehensive framework for underdestanding what it means to adopt an ethnographic-informed approach to agent-based modelling – as opposed to both abstract modelling and statistically-informed modelling.